Next Day Flyers is one of the best overall online printing services, combining quality and speed in an easy-to-use process. With one of the best turnaround times in the industry, and a great online designer, Next Day Flyers offers several competitive advantages. Deadline driven, simple to use, and detail-oriented; Next Day Flyers delivers overall quality in an all-in-one online print-on-demand service. As the name indicates, NextDayFlyers specializes in printing quality flyers, something we confirmed after putting them to the test. However, the business cards we tested are merely average, making NDF great for flyers, but not much else. NextDayFlyers offers low-priced stationery and signs and banners, and they have average-priced paper marketing materials and promotional materials. They offer a selection of paper marketing materials and stationery, but they don’t offer many promotional materials or signs and banners. NextDayFlyers lets you upload and print an existing design, and they also offer predesigned templates and a design tool to help you create your design for some products. We found it very easy to upload a completed design. However, they do not offer a PDF proof of your design or allow you to order free paper samples, both of which we consider to be market standards. 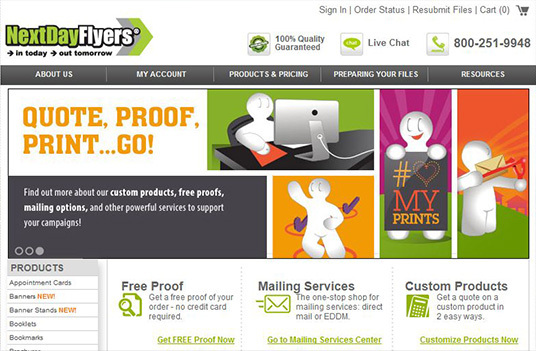 NextDayFlyers offers a mailing service for some products (i.e. they will print, address, and mail the products for you). We found their customer support to be average quality. NextDayFlyers has a standard shipping time of 4 business days, which is faster than our Market Standard shipping time of one week. Their name is their promise. Next Day Flyers boasts of their fast approach to printing. They even do same day turnaround. To ensure that their clients get the highest quality of their service, they provide a 100% money back guaranty to unsatisfied customers — no questions asked. Other Products Offered: Banner Stands, Posters, Table Tents, Invitations, Envelopes, Bookmarks, Calendars, CD/DVD Products, Door Hangers, Folded Cards, Gift Certificates, Greeting Cards, Magnet Cards, Magnets, Menus, and Rack Cards. Other Services Offered: Every Door Direct Mailing, Blind Shipping, Design Services, Online Design Service, and Custom Printing Services.